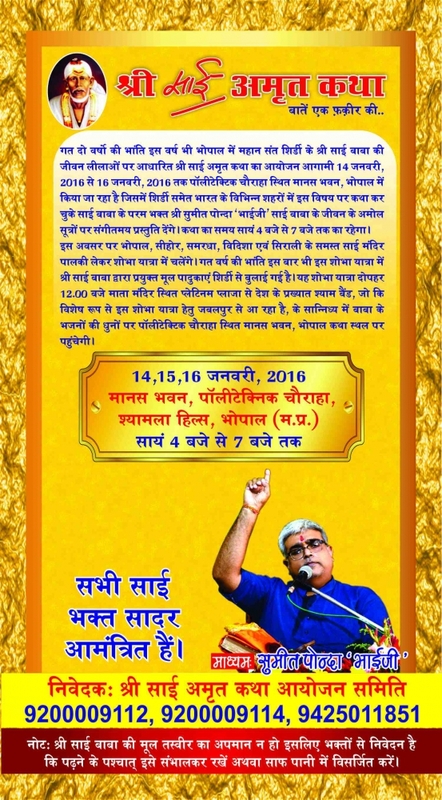 Shree Sai Amrit Katha at Bhopal on 14 , 15 , 16 th January 2016. 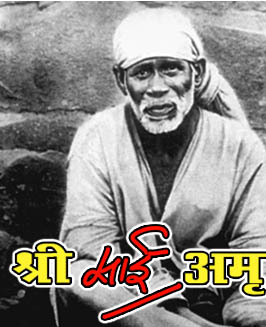 As in the past 2 years, Shree Sai Amrit Katha based on life of Shri Sai Baba, The Great Saint of Shirdi will be organised this year also in Bhopal. The programme is being held from 14th January 2016 to 16th January 2016 at Manas Bhawan, Polytechnic Square, Bhopal. The life of Shri Sai Baba will be presented by Shri Sumeet Ponda Bhaiji . A true Sai Bhakt, Shri Sumeet Ponda Bhaiji who has presented many such The Life Experiences of Shree Sai Baba in the form of Shree Sai Amrit Katha at various cities of India including Shirdi. The Katha will be presented from 4 PM to 7 PM all the three days. A Grand Shobha Yatra will be organised on the occasion, which will be attended by Shree Sai Mandir of Bhopal, Sehore, Vidisha, Sirali. The original Charan Paduka of Shree Sai Baba will be the part of Grand Shobha Yatra, The Shobha Yatra will start at 12:00 noon from Platinum Plaza Mata Mandir, Bhopal to Katha Sthal, Manas Bhawan, Polytechnic Square, Bhopal. The famous Shyam Band from Jabalpur will be playing Sai Bhajan during the Shobha Yatra.